If you are fortunate enough to have a local river that has an endless season, and possess the mental fortitude to suffer through numb fingers and frozen toes, then winter fly fishing season is a great opportunity to fill your fishing logs with additional entries. Fish and thier prey are still active throughout the winter months -- albeit with slower metabolic rates -- allowing for additional fly fishing opportunities. Only during the coldest spells of deep winter can conditions truly get bad out there leaving the most attractive option to stay home to restock fly boxes. What I find amazing is that when the mercury drops into the teens and below, a few die hard individuals will gleefully brave the elements to chase fin with a fly rod. The following selection of fly patterns are frequently added to my winter fly box that have served me well throughout a variety of winter fly fishing conditions. While midges, aquatic worms and baetis dominate the buffet line when sustaining fish through the long dark winter months, cased caddis are a frequent food source. Caddis larva will engage in behavioral drift in search of fresh food supplies or to redistribute the population for better genetic diversity. This behavior makes them vulnerable to easy predation. I often find cased caddis in gastric samples beginning in the late fall and throughout the winter months. I often employ a heavy tungsten bead jig as an anchor fly in a multiple fly rig in tandem with an aquatic worm or midge larva imitation. Pictured left is a simple cased grannom with a trailer hitch for adding a dropper behind the fly. What better way to get down deep than with a cased caddis pattern that will both serve to look like a typical stream resident and a likely food source? Update: I often have mallards and other dabblers feeding in the shallow riffles above the pools that I like to fish. The dabblers feed on cased caddis and often knock them loose in the drift. if I have feeding ducks upstream of me I will use a cased caddis imitation. Tail: Green Antron burned on the ends to make a small head. Rear Collar: Grizzly hen hackle, 1-2 turns. Bead: Black or gold tungsten. Band: Optional - metallic orange. Body: Red phase grouse, split and trimmed. I learned to love the Big Pink while winter steelheading in the Pacific Northwest. I used to tie up six inch long rabbit strip versions of this to swing in front of winter steelhead. My largest, a 20 pound steelhead was taken with a pink MOAL articulated pattern. For trout's sake, we don't have to anger them by intruding thier personal space with a massive swimming Mother of All Leeches dressed in pink. Instead, a reasonablly sized pink tungsten beaded version does nicely. Hook: Firehole Sticks 316 #8-16. Rear Collar: Pink frosty dub. Blood Worms are found in the sand/silt margins of all bodies of water. After a freshet, sand/silt pockets become perturbed and blood worms can end up in the drift. This is a great fly to have on hand to use after a pulse disturbance in the flow regime. You may want to try one of these if you are fishing downstream of another sloppy angler. Think San Juan shuffle? Hook: Firehole Sticks 321 #8-16. Body: Small blood red D-rib, wind forward leaving a distinct gap between wraps. Mark the thread with a gray marker at the thorax area before winding thread forward. One can never have enough midges in thier fly box, nor have enough variety of patterns. Midge patterns are like the little jewels of a fly box with beads, wires and a variety of colorful tinsels all adorning the smallest hooks. Aside from tying such small patterns, I love the creative license when tying attractive midge patterns. Hook: Firehole Sticks 316 #18. Tail: Dyed red hackle fibers. Body: Veevus holographic rainbow tinsel. Thorax: 16/0 Veevus red thread. Note: By far my most productive fly over the last two winter seasons. 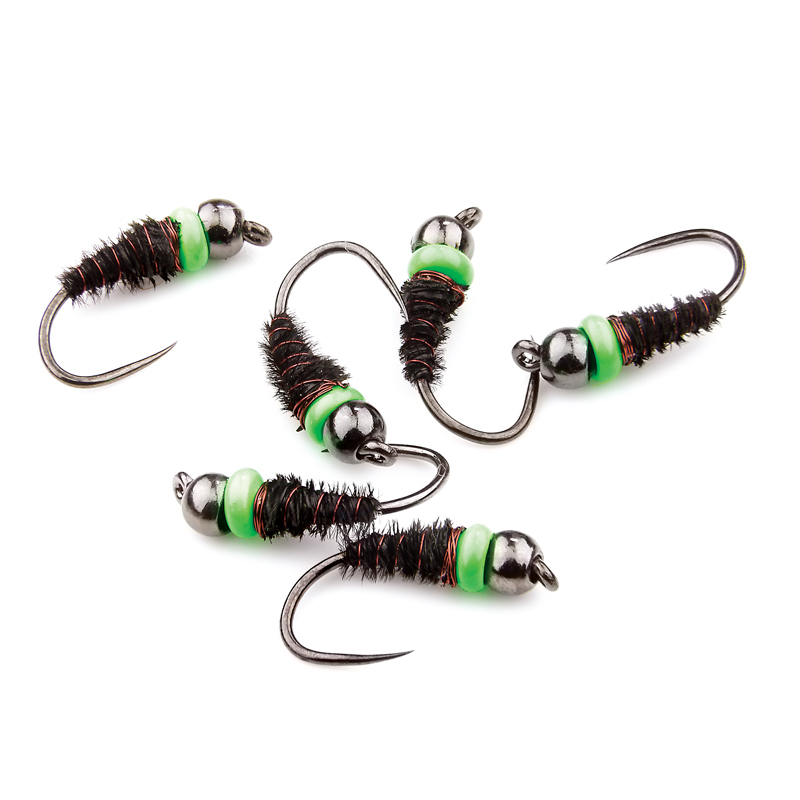 Bead: Killer Caddis gun metal glass bead. Body: Dyed adams gray pheasant tail (Nature's Spirit). Rib: SemperFli .1mm ice blue wire. Wing: Hemingway's white frosty dubbing, clipped short. The Gun Metal Shop Vac is a cross-over pattern that does well at imitating both midge pupa and baetis emergers. Hook: Midge hook #18, 24. Body: D-rib, Olive green, black, tan or gray. Flash: Small Pearl mylar tinsel, coated with UV resin. Super simple and most effective. Though frequently referred to as a bloodworm for its worm like larva, the zebra blood midge is actually a chironomid, or a true midge fly. These active 1/4-1/2" or larger larvae are found in almost all water types all year long, but winter finds them more abundant than other available foods. Blood worms prefer soft sandy or silty substrates often found near back eddies or along stream margins to colonize. After a freshet, blood worms are often dislodged from these soft areas and sent adrift making them available for trout. Hook: Firehole Sticks 316 #14-18. Bead: Iridescent Silver glass bead. silver tungsten for heavier patterns. The color purple and blue perform wonders in the winter because the low angle of the sun allows the blue wavelengths of light to dominate. This allows the cooler spectrum of colors to radiate nicely, especially when sunk deep into a trout filled pool. Hook: Firehole Sticks 316 #16-18. Body: Blue and silver small uni-wire. Thorax: Teal blue Veevus holographic tinsel. I found this pattern floating around on the internet and gave it a try. It has a lot of qualities that I look for in a fly pattern: simplicity, flash and iridescent qualities.